Organized criminal networks are global phenomena that distort local and global economic markets, spark violence and blur the role of the state in providing basic services. The main weapon used by such networks is corruption—of politicians and of many of the state apparatuses in the countries in which they operate. This undermines the basic principles of democracy and puts the state at the mercy of illicit economic interests. NIMD, International IDEA, and Clingendael have facilitated a research study on this topic, which was conducted in 2014. This study focuses on experiences in Colombia, Ecuador, Guatemala, Honduras and Peru. 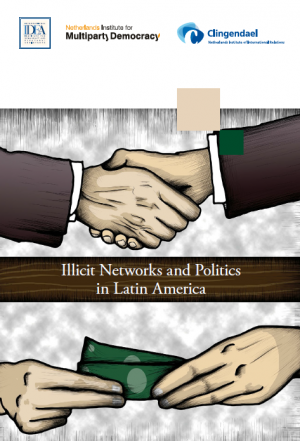 The results are summarized in the publication ‘Illicit Networks and Politics in Latin America’. The authors draw on research that illustrates how relationships are forged between criminals and politicians. They identify numerous mechanisms for tackling these relations, and discuss both the achievements and the challenges concerning their practical application.